The quick solution is to manually clear this session. Either via the GUI (Monitor -> Session Browser) or via the CLI ( clear session id <id>). However, as long as the end user manually types in the same malicious URL, this problem arises again and again. A long-term solution is to have a unique Anti-Spyware Profile with a DNS signatures action of “alert” for the outgoing DNS requests (= DNS proxy to Internet DNS servers), while the profile for the incoming DNS requests (= user to DNS proxy) has a profile with “block”. 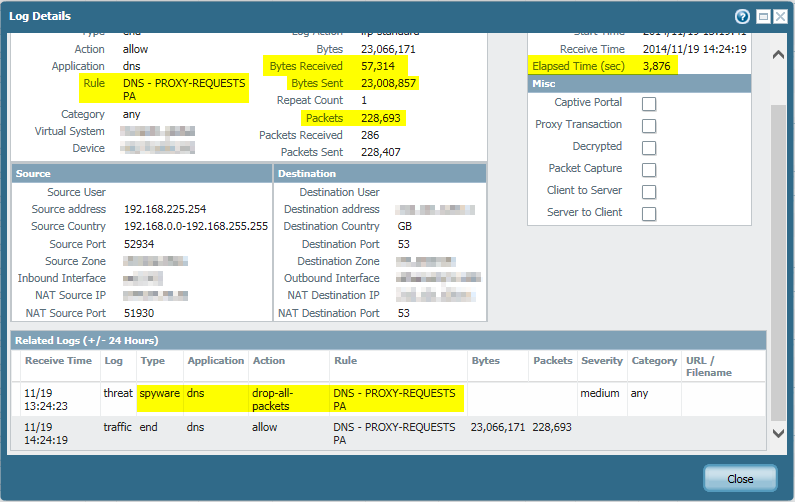 That is, malicious requests from a user only block the DNS session from that particular user while the main DNS proxy session stays active and functional. Featured image “Wasserschlange” by Benny is licensed under CC BY-NC 2.0.
what about blocking malicious DNS queries before they can reach a firewall?